Access Now was founded in 2009 immediately after the contested Iranian presidential election sparked widespread protests, and so recent developments in Iran are of particular importance to the organization. Now, almost 10 years later, as Iranians take to the streets in different parts of the country, they are once again facing multiple challenges to exercising their right to free expression online. Ever since this new wave of protests erupted, Iranian authorities have disrupted internet and cellular networks, reportedly in an attempt to control the flow of information going in and out of the country, as well as to stop people from organizing and gathering for protests. These actions are extremely harmful and counter-productive. Not only do internet shutdowns violate human rights, they also have a wide range of other consequences. They interfere with daily life, separate loved ones, block emergency services, and damage the economy. That’s true not just in Iran, but anywhere that these blunt and inherently disproportionate disruptions take place. There are a number of tools available to help people in Iran circumvent shutdowns, as well as to document the interference with communications — a crucial task in laying the foundation for global advocacy to stop the interference. Below is a look at the recent censorship events in Iran, the circumvention tools that can be used, and the actions people around the world can take to help those in Iran exercise their fundamental rights and freedoms online. The people of Iran have experienced many different forms of shutdowns and interference with their communications, including nationwide blocks of Instagram and Telegram, throttling of some connections and protocols, and shutdowns of the cellular network in some cities. Reports suggest that authorities have primarily targeted cellular networks for interference, which has a profoundly negative impact on people in Iran regardless of whether they are participating in protests. Iran is disrupting connections to ​D​igital​Ocean, which provides primary and backup servers for hosting a number of circumvention tools such as Lantern, as well as hosting sites and services for a variety of tech startups in Iran. The impact to these tech startups in Iran may prove catastrophic to their fledgling businesses, as users are typically impatient and any disruption could see them abandon the services provided by Iranian startups for competing platforms elsewhere. History shows that users rarely come back, even after a disruption has ended, and this disruption of access to DigitalOcean from Iran is likely to deepen the economic impact resulting from the shutdown. Ever since the 2009 protests, Iran has blocked a number of messaging apps and social media sites, including Twitter and Viber. But when the current period of unrest began on December 28, 2017, the authorities further tightened their grip over social media. Iranians began to report that they could no longer reach sites and mobile apps such as Telegram and Instagram. Our friends at the Open Observatory of Network Interference (OONI) and Netblocks confirmed this interference and analyzed how the censorship was implemented. According to Netblocks, authorities have deployed at least two separate blocking techniques, one for short-term “JIT” (Just in Time) blocking and one for a long-term media censorship. Data from Netblocks show that the blocks are implemented consistently, meaning that internet providers are complying with censorship orders across the board. Netblocks further found that Instagram and Telegram have been blocked using the short-term blocking technique, while some international news and other social media sites are comprehensively blocked. These new internet restrictions have prompted many Iranians to use circumvention tools such as the Tor network. 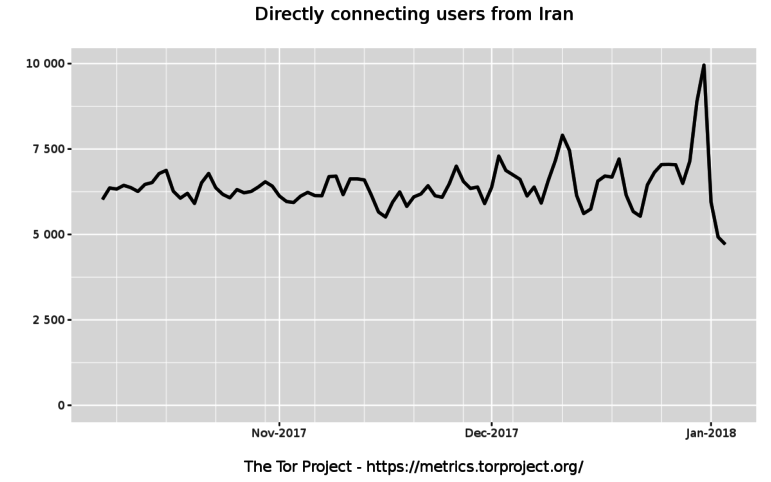 In its report on internet censorship in Iran, OONI shows that there was a sudden spike in Tor use on December 31, 2017, when internet providers began to block Telegram and Instagram, but before they began to block access to the Tor network itself. Data from multiple sources indicate that Iranian internet users today are making use of a wide variety of circumvention tools that allow for selective access to blocked resources. It may be that since the Green Movement protests in 2009, Iranian users have developed a more sophisticated understanding of internet filtering, supported by the further development of technical expertise domestically and through efforts like those by Access Now and our partners to assist Iranians in the exercise of their fundamental rights online. For many people in Iran, dealing with government internet filters may have become part of everyday life. However, this latest internet crackdown represents an escalation of online censorship. Even though more people have likely become skilled with circumvention, they may not have been able to access circumvention tools. Following is a list of tools that may be useful for bypassing restrictions to sites and content. NOTE: If you are inside Iran, it is critically important that you DO NOT jeopardize your own safety in your activism. If you are concerned about your digital security, or you have questions about using any of these tools, please contact our Digital Security Helpline directly for advice. Web-based proxy tools can help circumvent censorship. They enable people to route their HTTP requests through a different computer (the proxy). Note: people who use web-proxy servers must be careful, since there are bad proxy servers capable of rerouting and modifying requests for malicious purposes. Never use or trust a proxy server that no one has ever heard of. And even if you receive the proxy from a trusted partner, play it safe and do not pass on any private information, especially if it is not encrypted. Psiphon is an award-winning circumvention system that uses a combination of secure communication and obfuscation technologies. Compatible with iOs, Android 2.2 and up. Works on Windows Vista, Windows 7, and Windows 8 (desktop). Lantern is an open-source software application for desktop and mobile users — an internet proxy tool designed to provide you with access to the open internet. Lantern is unique because it uses peered connections as a source of internet connectivity when servers are unavailable. Available for Android, Mac, Windows, and Linux (desktop). A VPN creates an encrypted tunnel between your device and a server somewhere else on the internet. All of your traffic is then routed through this tunnel, protecting you from adversaries that might want to tamper or block your traffic along the way. Although your traffic will be encrypted, the VPN provider can keep logs and records of your online activities. Therefore it is important to trust the VPN provider you use. This site compares many different VPN providers and can be useful when selecting a VPN provider. Bitmask is a client-side VPN that uses Riseup and Calyx VPN servers. Available only for Android, Linux and macOS users. Windows versions are expected to be released soon. The Tor network is blocked in Iran, but it may be possible to connect to it through the use of Tor bridges. When configuring Tor Browser, you can connect to the Tor network by using obfs4 bridges. You can obtain obfs4 bridges by visiting https://bridges.torproject.org/ or by sending an email to bridges@torproject.org. Tor browser is an open-source software that protects you by bouncing your communications around a distributed network of relays run by volunteers all around the world. This makes your communications difficult to trace, but also allows you to bypass online blocks. At certain locations, where connections are slow, it might be difficult to establish a connection through the Tor network. The Tor Browser Bundle lets you use Tor on Windows, Mac OS X, or Linux without needing to install any software. It can run off a USB flash drive. Please keep in mind that only the traffic from the Tor browser will go through an encrypted an anonymous channel. Other applications, like Skype or a regular browser, will not be routed through the Tor network, even if the Tor browser is running. Orbot is an anonymity tool for mobile devices. The most recent versions of Orbot allow users to redirect all the traffic of their apps through the Tor network, using a VPN on Android through the touch of a button. Orbot is only available for Android. Tails is a live operating system that you can start on almost any computer from a DVD, USB stick, or SD card. Tails uses the Tor network to route your communications, and includes several tools that help you protecting your privacy and anonymity. Because of the default usage of the tor network for your Internet traffic, tails will be useful to circumvent online censorship. Below are options for taking action to help the people of Iran exercise their right to free expression, which includes access to information. But as we note above, if you are in Iran, it is critically important that you do not put yourself at risk in your activism. If you are concerned about your digital security, please contact our Digital Security Helpline directly for advice. Inside Iran? You can help. 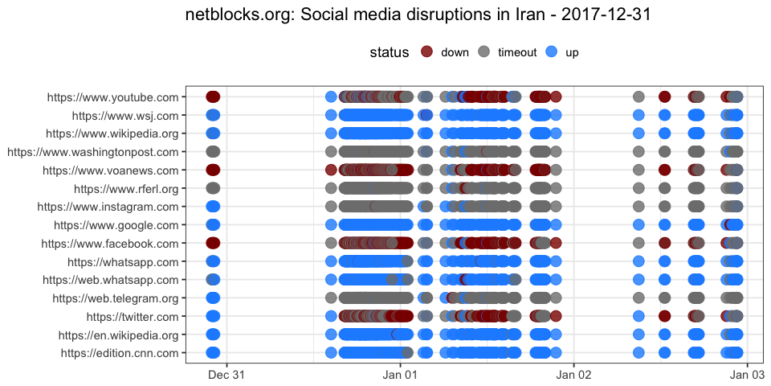 If you are in Iran, you can help #KeepitOn members Netblocks and OONI map and measure the latest internet and telecom restrictions. This is important because it helps to establish evidence of human rights violation. However, these tests require turning VPNs off and entail potential risks. For example, anyone monitoring your internet activity (e.g. ISP, government, employer) would be able to see that you are running OONI Probe or Netblocks scans. If you decide to run these tests, we would recommend reading more about potential risks, closing all your browser tabs and other applications before turning your VPN off, and turning your VPN back on as soon as the probe tests are complete. For Netblocks, you can run a scan by clicking on this link. This technique was devised as an alternative to hardware probes. The traffic profile is similar to a regular news website with social media sharing buttons. For OONI, you can run OONI Probe on Linux, MacOS, or on a Raspberry Pi, or install the OONI probe app on your mobile and add specific websites to OONI run. If you have experienced an internet shutdown in Iran, we encourage you to share your story with us. Documenting the real-world impact of a shutdown is vitally important for global advocacy. Outside of Iran? You can still help. In addition to facing domestic restrictions, the people of Iran face restrictions to using internet apps because of U.S. sanctions – or rather, over-compliance with sanctions. Google has now implemented restrictions that could help Iran’s government prevent Iranians from using encrypted messaging app Signal. You can sign a petition that calls on Google to rethink its decision or whitelist Signal and Tor to use its Google Apps Engine product, which enables apps like Signal to circumvent filtering for its encrypted message and voice content. Additionally, Google could apply for a specific U.S. government license to provide its Apps Engine to Iranians. Also, in summer 2017, both Google and Apple removed from their app stores those apps developed by Iranians, citing longstanding U.S. sanctions on Iran for their deletion. This has had the unintended consequence of strengthening the government’s control over the flow of information during the shutdown, pushing people toward less secure apps, and even threatening their jobs. Before Telegram was blocked in Iran, it was one of the most popular messaging apps and social media platforms in the country. Recently, people in Iran have been telling Telegram how disappointed they are that the company is complying with the government. They are also worried about Telegram’s evident dismissal of potential security breaches. You can speak out in solidarity, sharing this article on social media and calling on the company to do better by its users in Iran, pursuing every avenue to live up to its responsibility to respect human rights. Finally, civil society groups can join the #KeepItOn campaign, which is now more than 150 organizations strong, with partners from across the globe. You can learn more about how to join us here.